Thousand Hills Golf Course in Branson, Missouri was recently named "Best of the Ozarks" by the readers of the Springfield News-Leader. See why Thousand Hills won out over stiff competition and why the course's design, staff, and location were all contributing factors in making it the best golf course in Branson. With eight high quality golf courses in Branson, visitors to the Ozarks have more choices than ever for playing a round. With a limited number of vacation days available, choosing which one to play can be a difficult task for visitors and area residents alike. To assist the decision making process, the Springfield News-Leader recently surveyed their readers in a "Best of the Ozarks" poll. In the Branson golf category the clear winner was Thousand Hills Golf Course. Already a Golf Digest 4 Star course, Thousand Hills was favored by the Springfield readers for three reasons: course quality, an experienced & courteous staff well versed in Missouri golf instruction, and a convenient location easily accessible from anywhere in the Ozarks. Course quality is always the first thing most golfers consider when choosing where to golf. Quality can be rated on difficulty, design, scenery and many other factors. Thousand Hills Excels in almost every category. The course was designed by the legendary Robert E. Cupp, designer of more than 60 courses throughout the world. 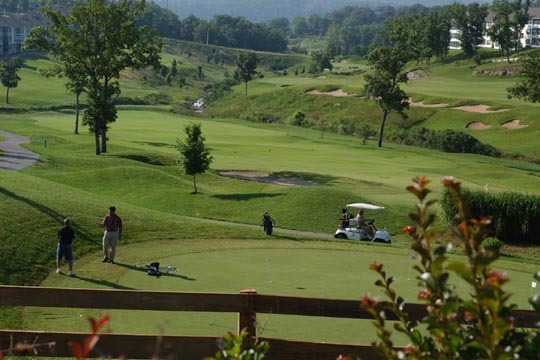 Thousand Hills is unique among golf course designs by nearly living up to its name--the course was built on, around, and often-times blasted out of the Ozark hills. Despite its short length (par 64) visitors to Branson will want to practice their chip shot golf, because getting a low score is deceptively difficult. With numerous creeks & ponds to play around, tree-lined fairways and sheer rock cliffs the course is as attractive as it is challenging. Whatever the golfers' handicap, Thousand Hills is designed to offer a rewarding 18 Holes. To help navigate the hills and valleys of the course golfers can turn to the experienced and friendly staff at Thousand Hills. From the meticulous greens maintenance crew up to Dan Davis, PGA Professional and course pro each staff member is dedicated to providing an unsurpassable golfing experience. For tips on playing the course and improving their golf game, readers highly recommended Mr. Davis. After graduating from New Mexico State University with a degree in Professional Golf Management, Mr. Davis trained under Ron Filipowicz, Robin Nigro, and Stan Thirsk--all legends in the golf world. Appointments for golf instruction can be made at the course Pro Shop or interested golfers can look into the series of free training articles available on the Thousand Hills website, starting with "Improve Your Golf Grip". These articles are intended to take a golfer step by step through all the master techniques and skills needed to beat par. The final reason Thousand Hills was chosen as Best in The Ozarks is its location. In addition to the breathtaking scenic beauty of the Ozarks, Thousand Hills is perfectly located for practical reasons as well. Located in the heart of Branson, Missouri it is minutes from major highways and the recently completed Branson Airport. Branson's central location also makes for a prime travel location from anywhere in the country and with over 7 million visitors per year, Branson has the hospitality industry to provide a world class stay for any golfer. Branson's location also allows for a generally mild winter, so Thousand Hills Golf Course is open for play year-round for those who hope the crisp winter air will help drive a golf ball farther. 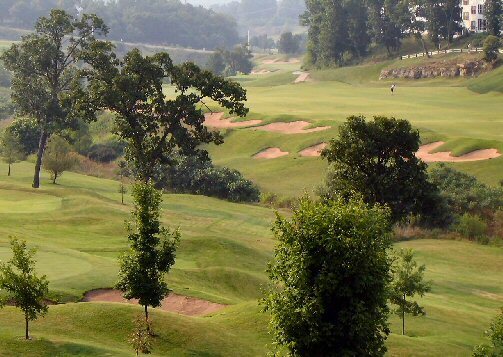 It's easy to see that Thousand Hills Golf Course earned the title "Best in the Ozarks" for a reason. From an exciting design, to a top-tier staff, to an unmatched location all the little things add up to make a one-of-a-kind golf experience. Visitors who want to start planning their summer golf vacations or who want to get golf putting tips from a pro are encouraged to call Thousand Hills Golf Course today at 1-877-262-0430 to schedule their tee-time on the greens of Thousand Hills Golf Course.